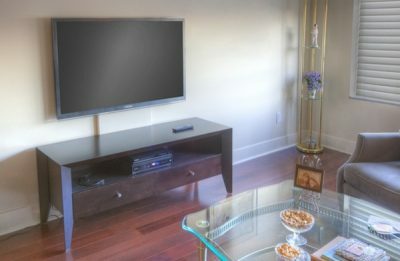 Perfect for condos and apartments, Lodging Innovations new Soft Mount system is completely non-invasive. It doesn’t require any large holes be drilled into the wall for cabling and can be attached to a single stud. The SoftMount is sheet rock friendly and contains all the mounting and cable management you will need. The mount is only 1.25″ thick adding very little depth to today’s already super-thin TV’s. The rear of the panel is sealed and vented to provide adequate ventilation for your TV. The mount is made from ultra-light MDF material that is available in several options. The prime coat finish allows you to paint over it the same color as your wall or special order it with your wall color matched already. To create a contrast against your wall it can be ordered in Satin Black. All mounts can come with a smooth or plastered texture finish. Mounts come in various sizes to ensure a proper match with whatever size TV you want to mount. They can only be used with newer and lighter sets as the maximum recommended weight is 60lbs. Price varies depending on size and doesn’t include professional installation. Check their website for details and a dealer near you.